Tradition is a powerful motivator, much like friendship. It’s been a strange, transitional year filled with more changes, opportunities, adjustments, educational moments, challenges, and triumphs than I’ve experienced in quite some time. In fact, I’m pretty sure my life hasn’t been this topsy-turvy since I graduated from college. I’ve done my best to stay positive about everything being thrown at me, but the reality is that there have been good days and bad. Without a doubt the hardest part of leaving Iowa was leaving such an amazing group of friends. My running journey began with Team Vardo and our paths will forever be linked. So, I was understandably quite excited to make the trip back during the first weekend in May so see so many amazing people, and run a relay event that I’ve been able to participate in for the last 4 years. My flight was much too early on Friday morning, but the Philadelphia Airport was of course already a buzz when I arrived around 6AM. After the requisite waiting, I did my time in a steel tube and landed in Des Moines mid-morning. Several friends were there to greet me, and it was wonderful to see their smiling faces when I got off the escalator! We hopped in the car, and it was go time. Friday afternoon was all about relay prep and we managed to stop for lunch in Des Moines as well before heading back to Ames. Ironically, it was in the low 80’s when I got there, which was much warmer weather than Delaware had seen to that point. My body wasn’t necessarily acclimated, but it felt great to feel the sun beating down on me. We met up with some other friends around 3pm for a short run. I had to keep my streak going 🙂 It felt strange to be “visiting” as we ran through campus and along roads I have logged so many miles on in the past. It was still great to be back and most of my sense of direction returned as we marked out our route. After about 5 miles, we headed back to the gym to shower, then grabbed a drink at a nearby restaurant before heading to dinner to meet up with a larger group of Vardos. It was fantastic catching up with so many people, and the caring and thoughtfulness that made me fall in love with this crazy group came out instantly and it was as if no time had passed. Of course a year had passed so there was plenty of catching up to do, and the time went by far too quickly. Visiting The Pig again this year! After dinner, the Speedy Streakers piled into the van (minus one teammate benched by family obligations) and down to Jefferson. We stopped at The Pig (bar) for our customary drink and dollar signing, and the bartender greeted us with smiles and sarcasm, just has she has every year! I was pretty tired at this point, and it was probably for the best that we made our way back to Nicole’s parents’ house and got settled for a few hours of sleep. Our starting time of 8:30 the next morning was later than we’d started in the past (I think we may have overestimated our speed!) but it did mean sleeping in a bit longer so nobody was complaining. The Speedy Streakers run again! Everyone got ready, pulled out their costumes, and had some light breakfast before we piled back into our moving base for the day and made the 5 minute drive to the starting line. We didn’t end up with an overall costume theme, although the ladies (and Ben) did manage some spectacular sock monkey costumes! Our goal this year, as every year, is to have fun first, and to run second. I wanted to run as many legs with as many people as possible this year, and I certainly had the chance to make that happen. I ran the first leg, as I’ve done every year, along with several others, and we traded off and Eric and I kept running for the second leg as well. Are you sure you’re ready for us?! The weather had cooled a decent amount, and storms were threatening during the morning but nothing much came of them, aside from a short delay for lightning in the area. The legs ticked off pretty effortlessly, as we were all really familiar with the route at this point, and we made sure that numerous folks were running each leg so everyone always had company. The overall mood was perhaps a bit more mellow than in previous years, but the pudding and Jell-O shots were still flowing freely. It felt really comfortable to be back there, in that place, with such an amazing group of friends, during that event. In many ways, it almost felt like home in a way. I suppose that’s the result of being so completely comfortable with a group of people and an area, eh? I ended up running 5 of the first 8 legs, and the morning hours flew by quickly. I was determined not to push as hard as I had in previous years so I still had some juice for the late stages, and I finally succeeded this year. I ended up running 8 of the 17 legs in all, including the hilly detour leg at the end, which didn’t seem nearly as bad as I had remembered it from a few years back. Thank you, Delaware hills! We made our way to the finish area and waited for Carla to come in on the anchor leg so we could all join her and cross the finish line together. She looked strong coming in, and we all made the final push through the finish line as they announced our names, and we picked up our finishers pint glasses. Another M2M Relay was in the books! Tradition, family, and running are interconnected for me. You simply need to return to some races…they mean more than simply a medal or a finish time. Times and logs never tell the full story. The power of running rests between the miles, in the conversations, the smiles, the trust, and the memories. 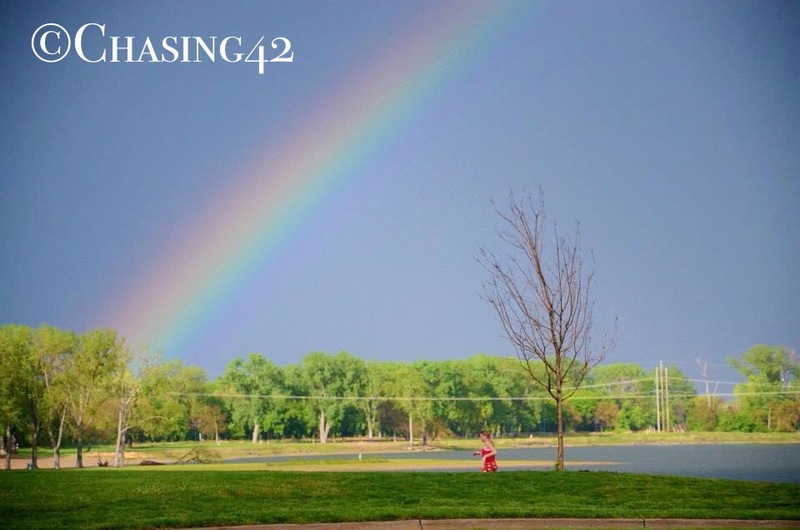 Remembering that is as important to #chasing42 as any race will ever be! I’m not entirely sure if runners as a whole are a strange bunch, or my own unique personality just happens to attract a strange group of friends. At any rate, I had the privilege of spending a few days with a great group of friends this past weekend. 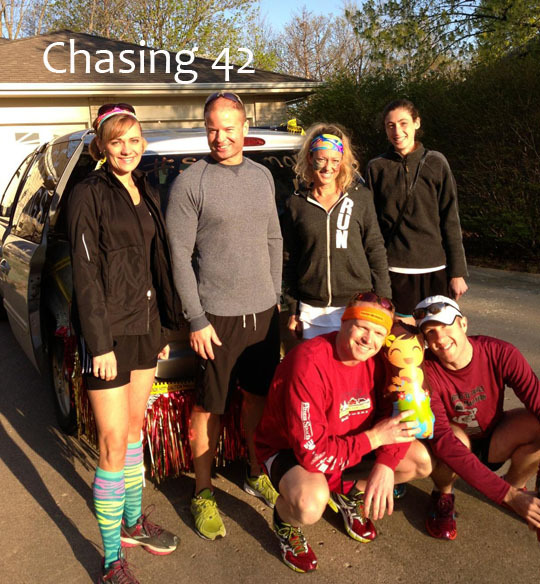 The fact that we crammed into an SUV and ran a relay race along some beautiful paved trails in Iowa was an added bonus! 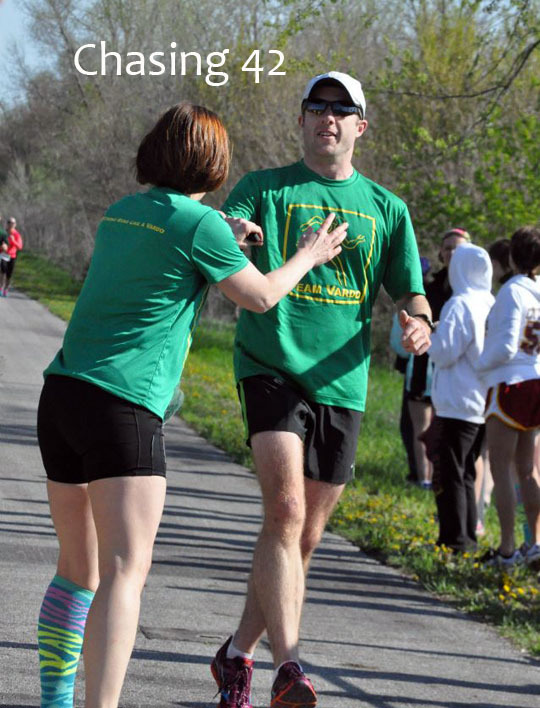 You may recall that I participated in the Market to Market Relay- Iowa last year. 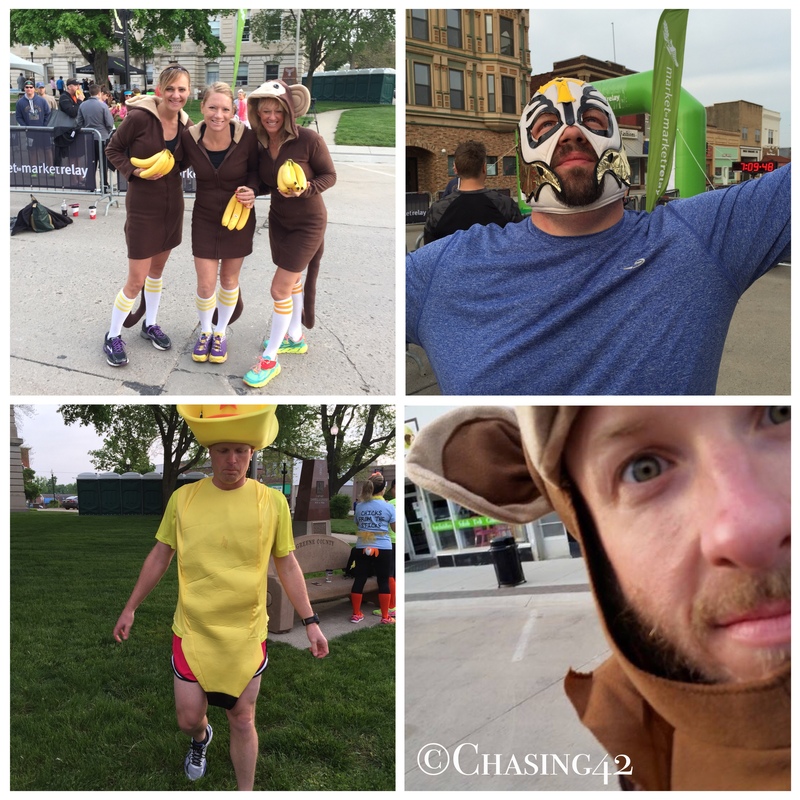 The “Speedy Streakers” were back this year for another dose of “jello-O”, strange costumes, and running shenanigans. We may have been a bit slower this year, but I think we managed to have even more fun, so I’d call it a win! We decided to rent an SUV this year for ease of transportation, and we once again headed over to Jefferson, IA on Friday evening to stay with a teammate’s parents. Her brother was actually a part of a second team, so we all got together for dinner and a relaxing night around the fire pit before heading to bed. 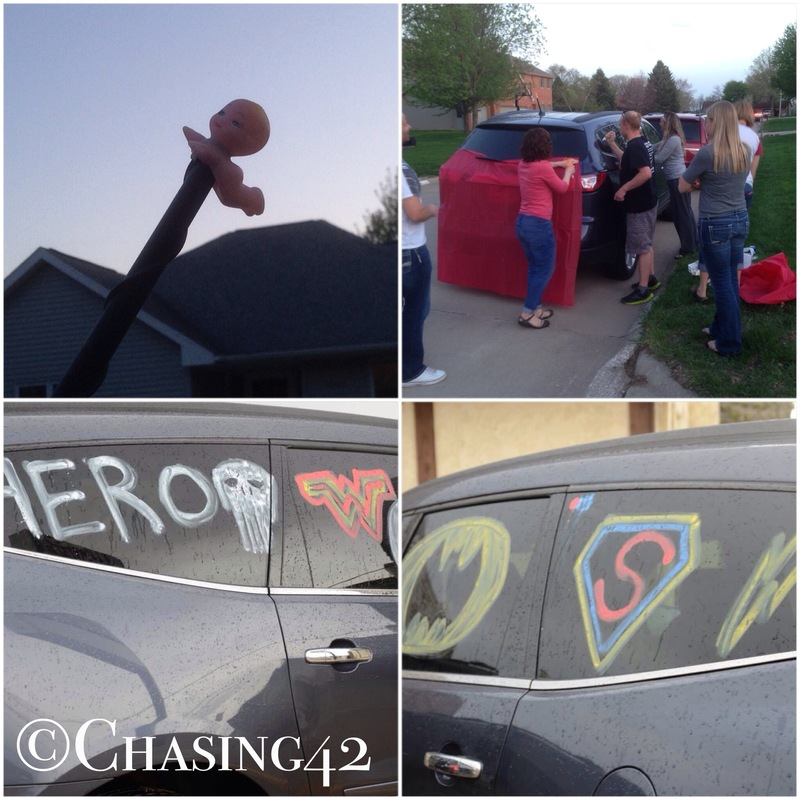 We made sure to decorate the vehicle with our superhero-themed logos while we still had daylight, and we were ready to go the next morning. Luckily, our wave didn’t begin until 8AM, so we didn’t need to wake up ridiculously early. However, you can’t rush a good super hero costume so we made sure we had plenty of time to prepare ourselves. 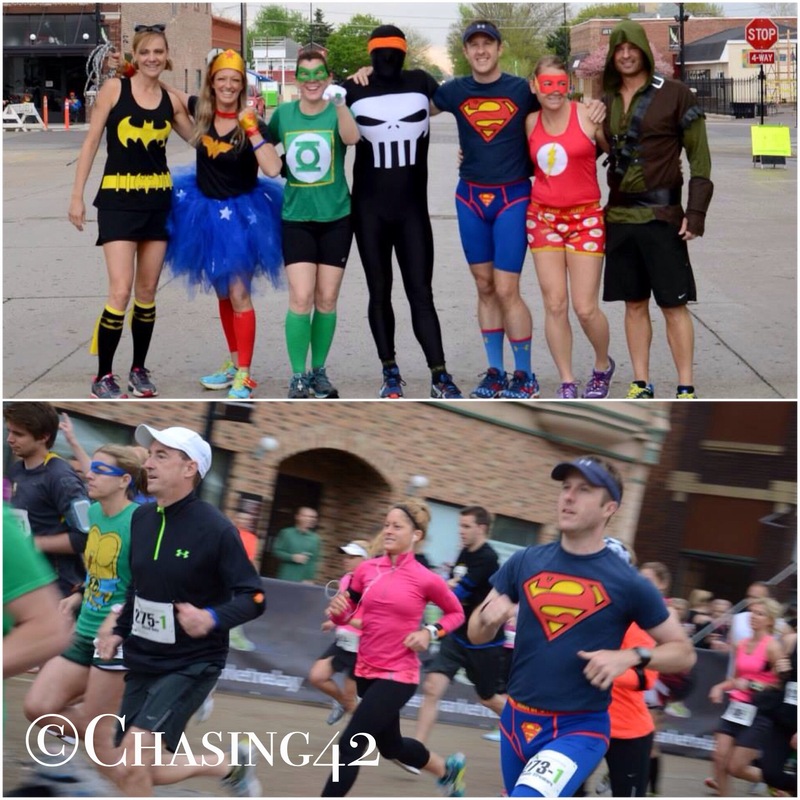 In most circumstances, a group of 7 adults dressed as super heroes in May would raise eyebrows. However, the relay encourages such displays of teamwork, and we were happy to oblige. Mind you, we still raised plenty of eyebrows with the level of spandex (and glitter) we were sporting! Getting the Super Hero Transport ready to go! We made the short trek to the starting line and picked up our packet and timing chip, and got set for a great day of running. We weren’t the only team in costume, of course, so we made sure to check out the competition, and make friends when appropriate. I was tapped to lead things off again this year, but I had no plans of going out quite as fast as I did last year. I was hoping to accumulate between 25 and 30 miles over the course of the day in order to stick to my training plan, so I knew I wanted to take it a bit easier. However, my adrenaline and the crowd around me probably got the best of me during the first mile and I looked down to see a 7:17 pace. I was determined not to see a “7” again 🙂 The first leg was fairly flat, and covered 4.8 miles in total. I kept subsequent miles around 8:10 and covered the distance pretty easily. When I reached the exchange point, I handed off the chip to our next run for the next leg. Normally, this would signal a rest, but I wanted to run some additional legs to increase my mileage so I kept on running with her for leg 2. It was a fairly overcast morning, and threatened rain most of the day, which made for a comfortable day of running (it did get warmer later, as well as briefly downpour!). The two of us covered the 3-mile second leg pretty easily, and were able to stay out of the wind for most part, which was nice. We rolled in and passed off the chip, and it was time to rest. One of the pieces I like most about this relay is how fast-paced it seems. As soon as you pass off the chip, you hop in the car and head to the next exchange point. Your team is busy joking, snacking, “hydrating”, and adding jokes to the fire, and things seem to fly by with ease. This was definitely the case throughout the day, as we hopped from one exchange point to the next. Stage 4 marked the inaugural running of the black Punisher morph suit for one very excited team member. It shouldn’t come as a surprise that it takes a special kind of person to wear a full spandex morph suit that covers you entirely (I can’t wait to get my own! ), and he made the most out of the experience. Some runners were more excited than others to engage with him, but we certainly got plenty of laughs out of it. Alas, it also proved to be incredibly warm and non-breathable, so he had to take it off after 1 leg. I decided to knock out a solid chunk of miles by running three straight legs. The first two would be with others, and the third would be my own second assigned leg. The 2.8 mile leg 5 flew by, and we clocked off solid 8:05 miles. I was probably going faster than I should have, but it wasn’t about my pace, and my own goal was to keep up with my teammates that were running. The 5.7-mile leg 7 proved to be a bit more taxing, but when you transition from running with Batgirl to running with Wonder Woman, you don’t really have much to complain about ultimately. 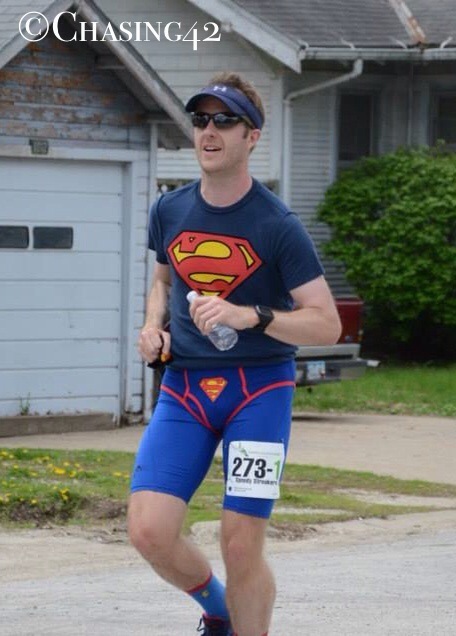 Wonder Woman and I pulled in to the exchange point after leg 7, and I took off on my own Superman solo 5.8-mile run (did I mention that I dressed up as Superman? 🙂 ). Midway through leg 7, it occurred to me that I probably hadn’t eaten or drank nearly enough yet. This is easy to do when you are bouncing from one exchange point to the next. This definitely meant that I was feeling a bit dehydrated by the time I took off on leg 8. Luckily, my teammates were amazing and noticed my fatigue so they pulled over down the trail and cut me off after less than a mile to hand me some water and a Hammergel. This intervention made those otherwise uncomfortable 5.8 miles bearable, and I was eternally grateful! I took it easy after that, and enjoyed the camaraderie in the car as we traveled from one exchange point to the next. When the only thing you have to worry about all day is running, it’s easy to have a great day! 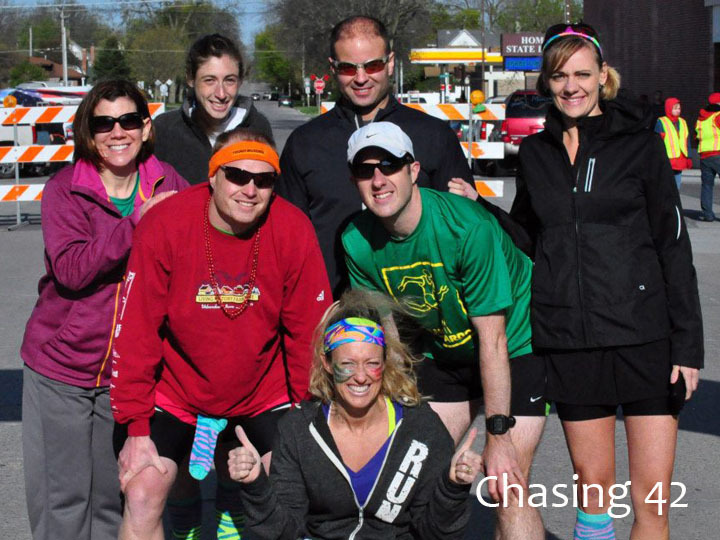 We passed up some teams along the way, but we really couldn’t have cared less about our pace. 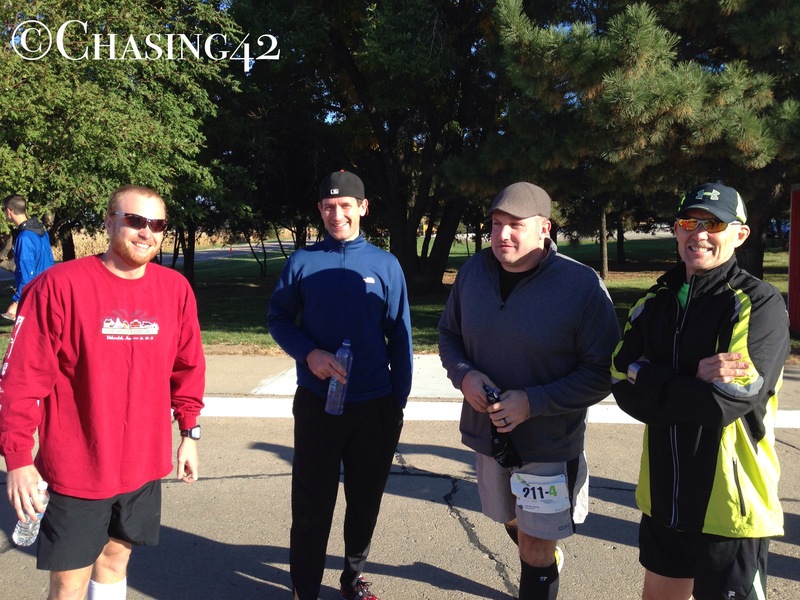 We were enjoying being out on some beautiful trails and hanging out with hundreds of other like-minded runners. When stage 13 rolled around, I decided to head out with Batgirl again to log a few more miles. The 4.9 miles were definitely a bit more difficult thanks to some stiff and fatigued legs, but I gutted it out, although I did send her on up ahead to the exchange since I was slowing her down at that point. I had a brief rest period before running my final 4.3 mile leg, and I needed every minute of it. The early morning, lack of coffee, lack of hydration and nutrition, and miles were definitely all catching up to me. Luckily, the fun factor trumped everything and kept me motivated as I headed out on my final leg with a teammate alongside me to keep me moving. After about a mile, we encountered a detour due to some construction on the trail, and we were forced to venture into some neighborhoods in Des Moines. I’m pretty sure this was Worst. Detour. Ever. I’m convinced the entire route adjustment was uphill, and we couldn’t help but laugh as we slogged on. At that point, knowing it was my last leg kept me going, and we happily arrived at the checkpoint and handed off the chip. As if it was designed as a cruel twist, we then had to venture up a long, steep path to get back to the parking lot. We got in the car and headed out only a few minutes before the sprinkles turned into a full-fledged downpour. We arrived at the next exchange point, and figured out the logistics for as smooth a transition as possible in the pouring rain. By the time Green Lantern arrived, she was soaked and happy to get out of the rain. Interestingly enough, the rain significantly dissipated not five minutes after she finished her leg. I guess Mother Nature was jealous of all the fun we were having! We arrived at the finish area and waited for the Flash, our final runner, to approach, and we joined her for the final 1/4 to the finish line. We were sore, dehydrated, hungry, and tired, but couldn’t have been happier to cross the finish line and collect our pint glasses. I finished the day with 31.2 miles, and the well-deserved after-party was just ahead. The Flash runs across Gray’s Lake…a perfect photo, courtesy of Wonder Woman! We took a “wet wipe shower” in the parking lot, changed into non-spandex clothes, and headed to the after party at El Bait Shop. The rest of the night was a blur of good food, good beer, and great friends. 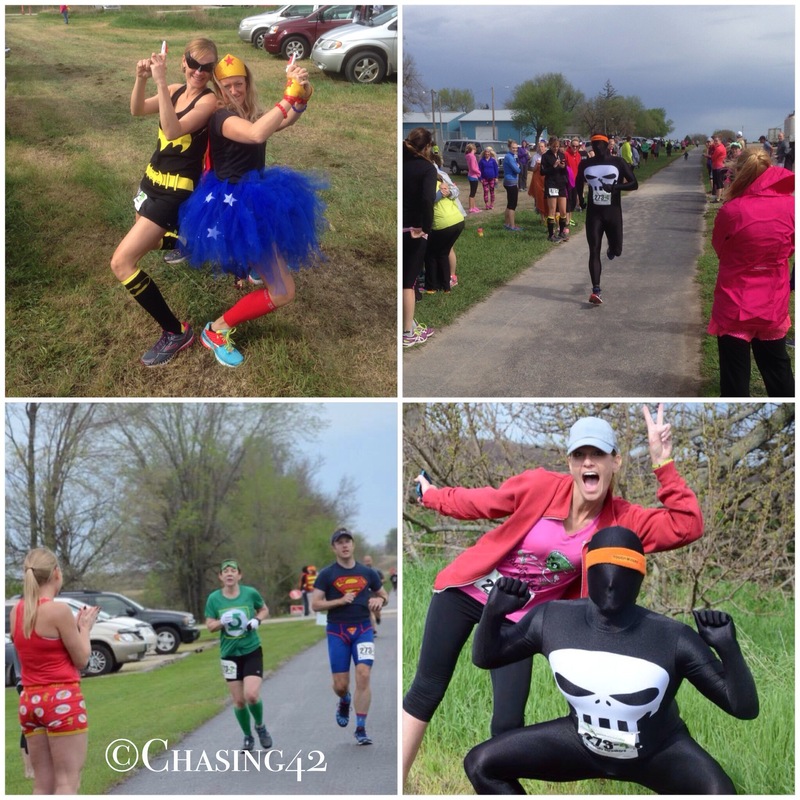 The Speedy Streakers had outdone themselves this year, and we had plenty of memories (and pictures) to remind us of our super hero antics. Another fantastic M2M Relay is in the books! 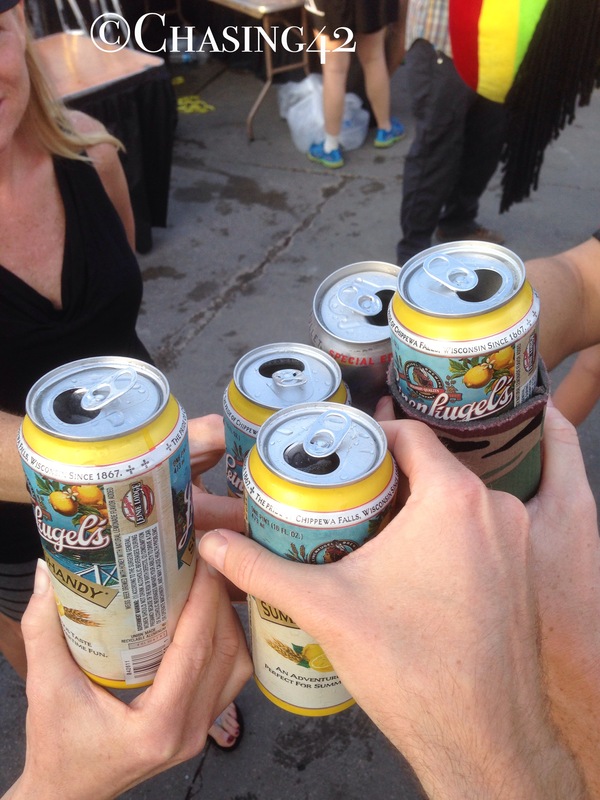 Cheers to another great relay! Normally, one of the biggest selling points for me when running a marathon or other race is the ability I have to control the outcome. I decide how much effort I put forth, when I push myself, and the perception of success is based on how I feel at the end of the day. Relays are a completely different story. I certainly have control over the legs of the race that I run, but beyond that, that overall satisfaction with the day depends as much on the people I’m running with, the weather, and a host of other variables. In this regard, I feel very luck to have so many amazing friends! 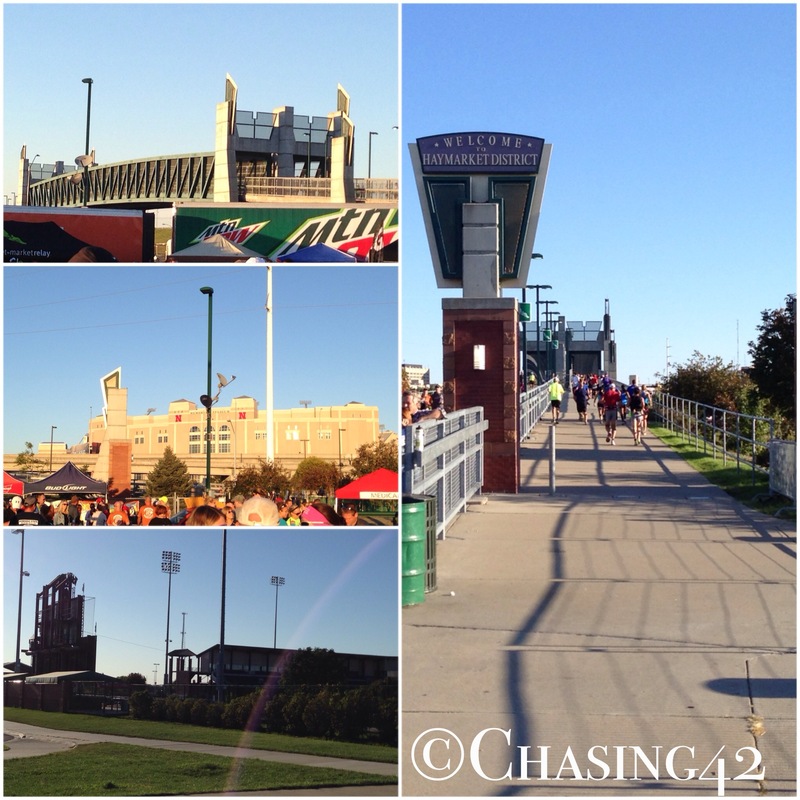 This past weekend, I joined a group of friends, some new, and some old, and headed to Omaha, Nebraska for the Market to Market Relay. 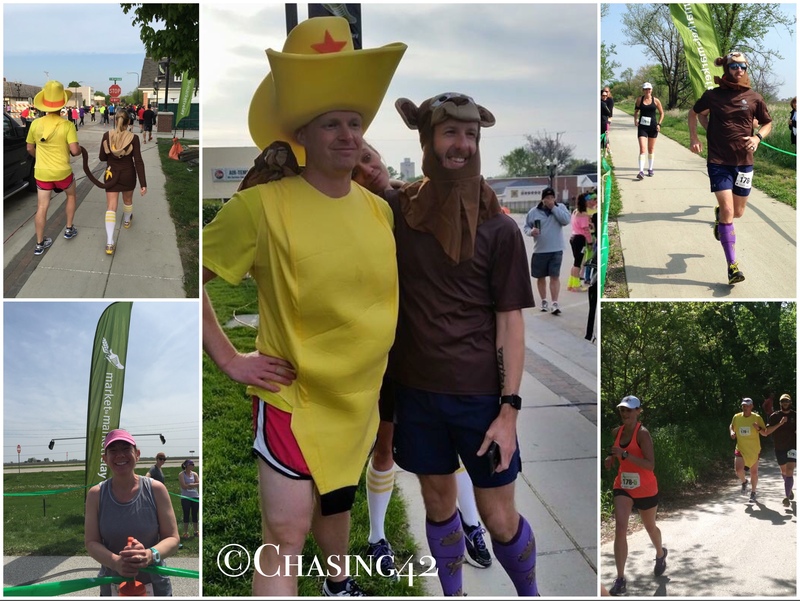 You may recall that I ran the Iowa iteration of the Market to Market relay this past spring, and the races are put on by the same directors. We loaded up the car on Friday afternoon and headed west. Luckily, one of my friends is from just outside Omaha, so we stayed his parents for the evening. They were gracious enough to host us, as well as feed us a delicious spaghetti dinner. His dad was actually running with us the next day, so the circumstances worked out perfectly. 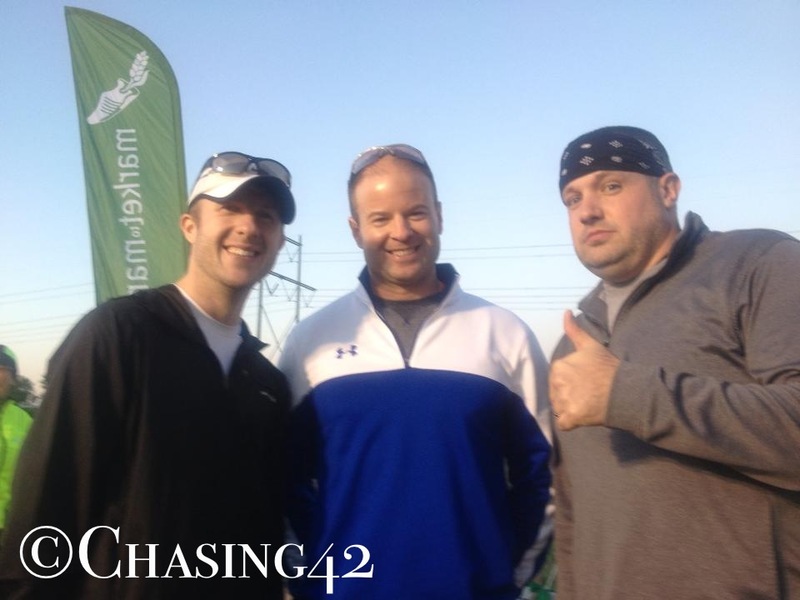 We woke up around 5AM, and drove the 30 minutes to the starting line of the relay in Omaha. We fielded a seven-person relay team, and I was slotted to run the first leg, so they dropped me off at a park in Omaha, and took off for the first exchange point. I had to be there 30 minutes early to pick up the timing chip and check in, so I had some time to warm up, which was nice. Now, as you may recall, I have a rather lengthier race coming up in December, and my training calendar called for 28 miles on this particular Saturday. Thus, I knew I would need to squeeze in some extra mileage on top of my scheduled 3 legs of the 78 mile trek from Omaha to Lincoln. It was chilly enough that running around the park while I waited for our wave to begin at 6:40AM made sense, so I knocked out 2.2 miles and loosened up a great deal. Is it time to run already? I wasn’t entirely sure how my pace would match up with others in our wave, since they try to stagger start times based on team average pace. The first leg was a quick 3.2 miles (all legs were between 2.5 and 5.5), so I knew I could push it hard with fresh legs. It was still dark out, so I strapped on the required headlamp and headed out with the gun. I quickly worked my way to the front of the pack (only about 30 other runners) and figured I would see how long I could hold my pace. Aside from a few runners who were clearly much faster than I was, I held my own around 7:00 min/mile, and wormed my way down the dark city path towards the first exchange point. My lungs were definitely exerting themselves, but my legs were feeling good and I came in near a 5K PR, for which I was really pleased. I handed the chip off to the next runner, and met up with everyone else to hop in the van and head to the third exchange point. It was still early enough that the lack of coffee in my system had not caught up to me yet. However, a lack of access meant I went the whole day without, and the caffeine headache certainly found me after another few hours. I knew that I’d need to find a way to run additional miles in order to reach my 28 mile training goal for the day, so I decided to join others on various legs in addition to my own. This decision ended up being a great choice and a lot of fun! The volunteers didn’t seem to mind or notice that there were two people from our team running, and it was fun to run with someone else as well. The short legs and driving between legs meant that everything was incredibly fast-paced, so being able to run with two of my teammates that I didn’t know as well gave me a wonderful chance to get to know them better. Through the first set of 7 legs, I ended up running 3, including some quality time on a very hilly stretch of gravel road. Unless Market-to-Market Iowa, which was almost entirely on paved bike trails, this relay took us over a variety of terrain, including more gravel than I would have normally cared for or chose. I ran the 4th and 7th legs, and then just continued with the 8th leg, which was my leg to run in the first place. After the back-to-back legs, I was definitely starting to feel a bit more fatigue. I had completed a little over 15 miles at that point, which just enough down time to cool off but not really recover. The stop and go nature of the day ended up taking its toll on my body far more than I imagined as well. My last leg was the longest at 5.2 miles, and after a relatively speedy first two miles, my quads started screaming at me, and I had no choice but to slow down a bit and push through the last few miles. I ended up running 7 of the 21 total legs, along with the final group run to the finish, for a total of 26.95 miles. Normally, my body tends to handle these distances really well, but the extended nature of the miles throughout the course of the relay left me more fatigued than normal. Additionally, I developed a hot spot below my pinkie toe on my left foot that irritated me more and more as the day went on. I’m not more convinced than ever that I need to see a doctor to figure out why I have so many issues with my left foot/leg, but never any problems with my right. In terms of nutrition, I wouldn’t say I ate well, but I took in mostly whole foods (trail mix, bananas, dates) and avoided chews altogether, and my body seemed to react very well, which was encouraging. We arrived together as a team to cross the final bridge in Lincoln, across from the University of Nebraska football stadium, into the finish area and after-party, and that last .3 miles was definitely stiff, but it felt great to cross as a team. In all, we tackled the 78 miles in 10:45, with an 8:11/mile average pace, which was mighty impressive in my book. More than that though, we had a blast doing it. As we sat at the after party, enjoying our free beer and pizza, the effort of the day began to weigh on us, and our energy reserves slowly reached empty. However, as we piled into the van for the drive home that night, we may have been exhausted, but we were happy, content, and leaving Nebraska as closer friends. That feeling of contentment is truly the appeal of relay events for me, and I was once again happy to be a part of the Speedy Streakers! Well deserved after a long day of running! 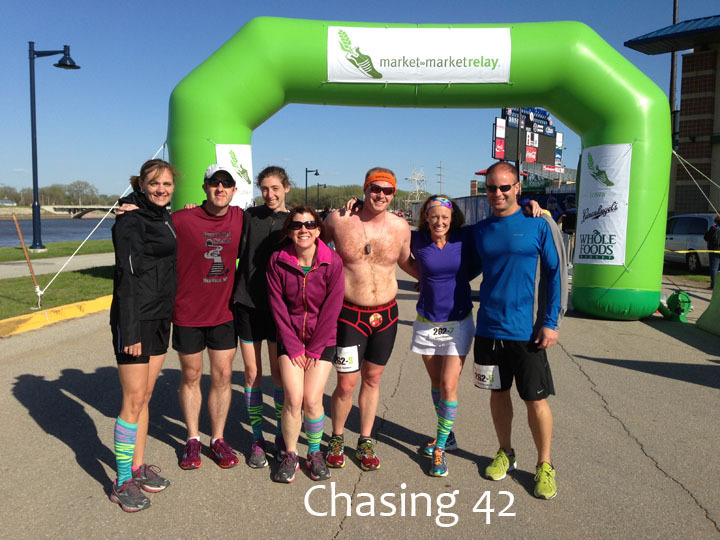 Market to Market Relay: The Speedy Streakers! There is no question that the popularity of long distance relay races has increased in recent years, in large part due to the Ragnar Relay series. The possibility of running in one of these multi-stage events has always been in the back of my mind, but the timing and location has never made it a possibility. However, with this increased popularity, other races have been popping up around the country. One such event is the Market to Market Relay series. 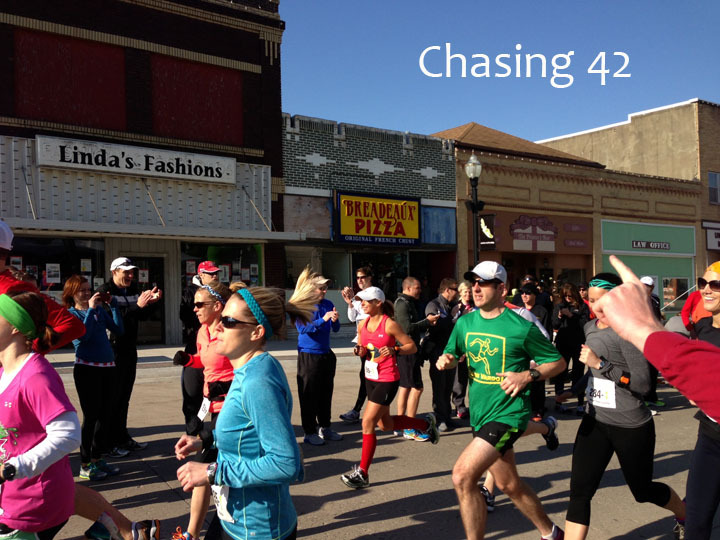 It started with a relay from Omaha to Lincoln, Nebraska (78 miles), and added a second race in Iowa this year. That’s where I come in. 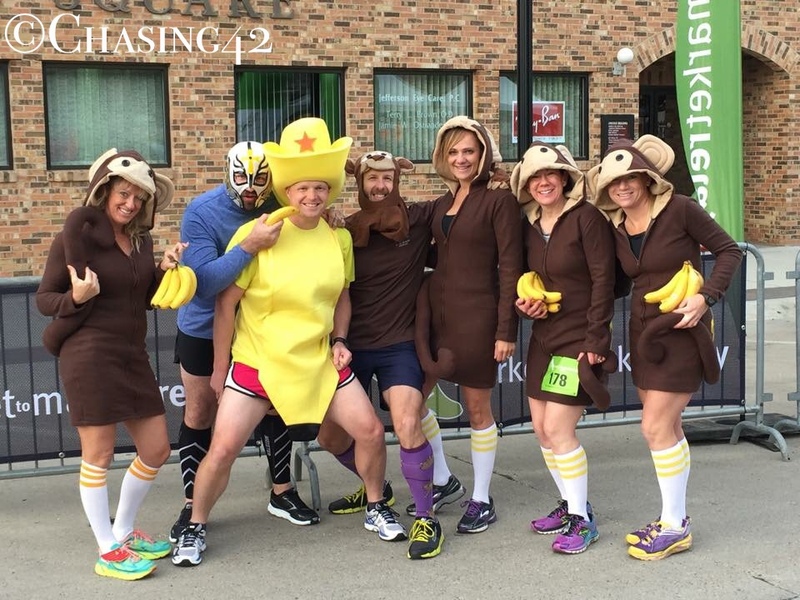 My amazing group of running friends in Team Vardo was quick to jump on the opportunity to participate in the first Iowa Market to Market relay, and I thought this would be a great opportunity to give relay races a shot. I knew I would enjoy the company, but I was uncertain of the race experience itself. I’ve been pushing myself towards longer and longer distances, and away from more speed work, so the relay represented just the opposite. However, the race and the experience far exceeded my expectations and ended up being the canvas for some amazing memories! The race itself was extremely well-organized. Teams of 6, 7, or 8 started in waves, accordingly to anticipated finish time, and faster teams started later. We comprised a mixed gender team of 7, and didn’t think of ourselves as terribly fast, but still ended up being slotted in wave 6 with an 8:30AM start time. This meant being able to sleep in a bit more, which was also very nice! We made our way down to the starting line to meet up with the two other Vardo teams, and see them off for their 7:30AM start time. The air was brisk, and the wind was whipping, but the sun was out so we had no major complaints. Luckily, the wind was blowing from the northwest, so we enjoyed a tailwind for almost the entire relay! The relay itself was broken into 17 stages, for a total of 75 miles. I ended up running the 1st, 8th, and 15th stages, and I was happy to start things off. My adrenaline was pumping at the start, as it is for most races, and I made every attempt to calm myself down so I wouldn’t start out too fast! Based on my most recent training, I was anticipating running around 8:00 minute miles. The first leg was a 4.8 mile segment, so I knew I could push myself a bit more. I took off with the others in our wave, with the rest of the team hopping in the van to race to the next checkpoint. I knew I started out a bit fast, but when I hit the one mile mark and looked down to see 6:54, I realized just how much I had been pushing. I haven’t been doing much speed work yet this season (although I am going to be starting soon, and have made the new shoe purchase- more to come later! ), but I figured I’d push it as hard as I could and see what happened. I flew into the first checkpoint and handed off the chip timer to my teammate, and when I stopped my watch, I saw that I had averaged 7:16/mile over those 4.8 miles. Certainly fast than I had expected from myself! The first of many exchanges! Throughout the day, each stage transitioned really quickly, and everyone on our team was going fast enough that we just barely made it to most of the checkpoints before we needed to make the handoff. As a result, there was very little downtime, and everyone spent the day pretty fired up. We had packed plenty of snacks and water/Gatorade, but the energy and pace of the day meant we didn’t consume nearly what we should have by the day’s end! The quick pace of everything, and the time we spent hoping in and out of the van made for some great conversations and plenty of great running memories. By the time I was due to run again at stage 8, we had almost caught up to the other Vardo teams, which meant we would start seeing them more at the checkpoints. It was great to be able to spend the day with so many friends, in addition to all the new friends and crazy runners we met along the way! My second leg was a bit longer at 5.8 miles, so I figured I had better take it a bit slower at first. However, my legs clearly had other plans as I clocked my first mile at 6:46! I was still feeling great, so I kept pushing it. With the wind at my back, I felt like I had leveled up in an old Nintendo video game as the miles kept flying by amidst the beautiful Greenbelt Trail. Despite a deceptive hill in the final half mile, I ran into the checkpoint with plenty of energy. I ran my second leg at a 7:12/mile pace. I’m pretty sure these were two of the fastest runs I had ever ticked off and it felt wonderful. We kept on jumping from stage to stage, only getting a bit lost once 🙂 By the time my last leg rolled around, everyone was beginning to feel a bit tired, but our energy was still high. 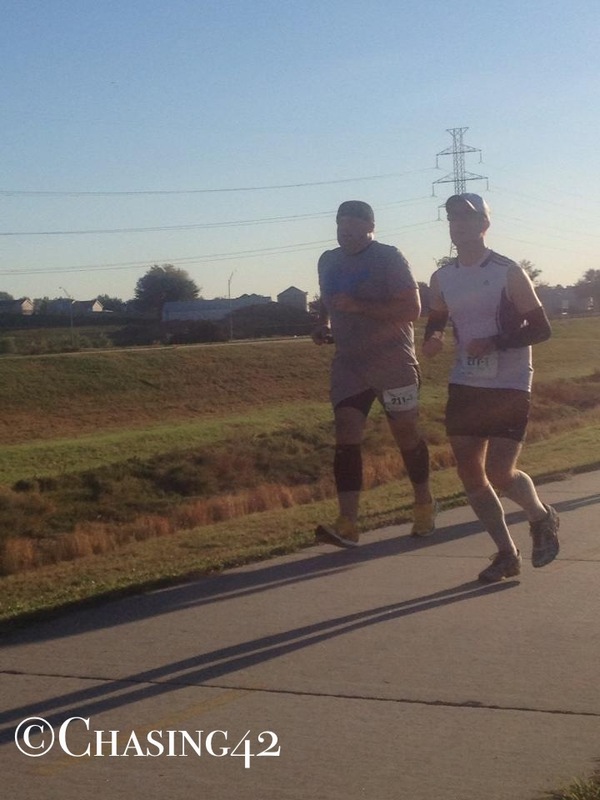 This was my shortest leg, at 4.2 miles, and I was determined to leave it all out on the course. By this point, we were getting close to downtown Des Moines, so we started to see more pedestrian traffic along the trail. This last leg proved to be my most unusual run of the day. After a mile or so (which I hit at 6:46), I ran past a wedding in progress at a public park. I’m guessing they didn’t realize there would be a relay race going on behind them, and it took quite a bit of self-control for me not to yell out “Congratulations!” as I was passing 🙂 Then, after another mile or so, I saw a few young boys up on the right. I didn’t think much of it and didn’t notice what they were doing until I got closer and saw one of them winding kite string in his hand. Before I could react, I felt the kite string clothesline me like a giant spider web wrapping itself around my neck! Instinctively, I pulled it off by yanking hard on the string, and ripped the kite right out of the tree without stopping. I probably could have felt a bit bad for ruining the kite, but they really should have known better considering how much traffic that part of the trail was getting. I started to slow up a bit, but still managed to pull into my final exchange with a 7:31/mile pace. After we made the final exchange, we met up with our anchor runner to run across the finish line together near Principle Park in Des Moines. We crossed the finish line in a little over 9 hours, and ended up averaging 7:29/mile as a team over the entire 75 mile course. We had far exceeded all of our expectations and ended up placing 23rd overall, out of 211 teams. After 9 hours of running from point to point, the after party in downtown Des Moines made for a great way to round out the night. 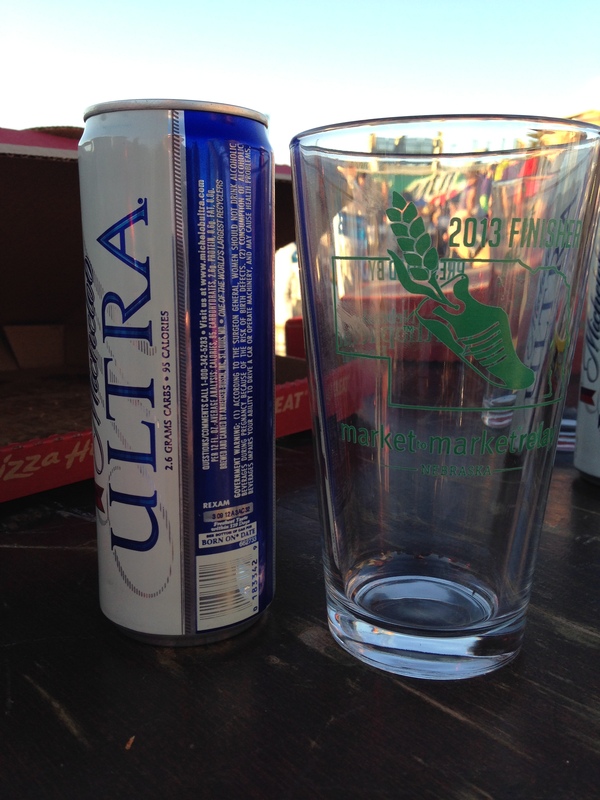 Beer always seems to taste better after running, doesn’t it? All-in-all, my first relay experience was a fabulous one, and we are already planning for our next relay experience!